B.fresh are third generation farmers, after our own heart, who have grown salad leaf, whole-head lettuce and spinach for the past twenty years. As home juicers for a number of years, Philip Maddocks, noted a lack of British grown and produced Cold Pressed Juice, and so decided to do it himself. He got busy, pulled the team together, designed and built a bespoke juicing facility on his farm in Shropshire, and developed the B.fresh brand. Most produce is grown on the farm and brought fresh into the juicery for pressing and bottling, but where seasonality or climate limit, B.fresh have well established relationships with growers, such as us at Wye Valley, who are pleased to be supplying B.fresh with asparagus during the British asparagus season. All the juices are cold-pressed – Which means the produce goes through a series of press rollers, which gives a fabulously smooth, and pulp free juice without using any heat. The importance of not using heat is to retain the highest level of nutrients, vitamins and minerals as possible. The juices are then mixed to make up their delicious recipes. To ensure the cold pressed, bottled juice arrives to you fresh, and still bursting with all of its nutrients, a method called HPP is used (High Pressure Processing). The process both makes the juice safe and gives it shelf life, keeping all the flavour and goodness of a raw juice. A replacement to pasteurization. 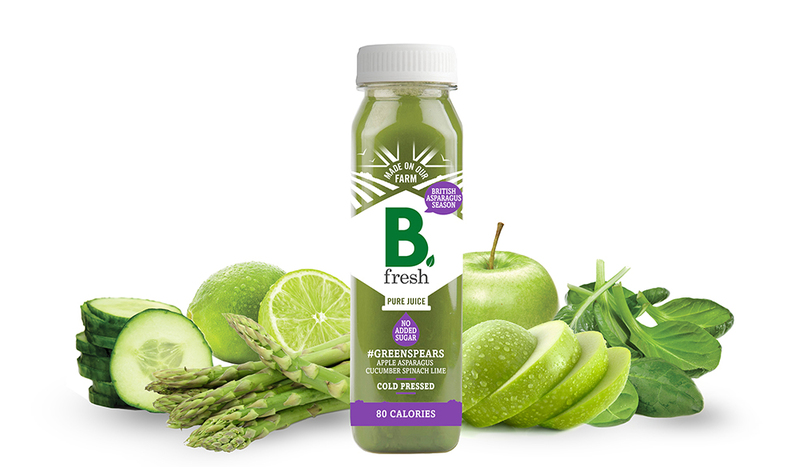 B.fresh juices can be found in Ocado, Sainsburys and Asda and #Greenspears can be purchased online at their website www.b-fresh.co.uk for £2.50 per bottle.